What is Apo-Prednisone (Prednisone) used for? 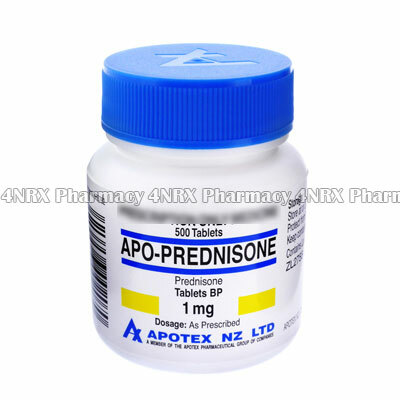 Apo-Prednisone (Prednisone) is an oral corticosteroid prescribed to treat patients who are suffering from a wide variety of inflammatory conditions such as arthritis or allergies. The medication prevents the actions of certain enzymes in the body that cause the pain, swelling, and irritation associated with these conditions. Your doctor may recommend its use for the treatment of other unlisted conditions. How should I use Apo-Prednisone (Prednisone)? Follow your doctor`s instructions while using Apo-Prednisone (Prednisone) to get the safest and most effective results from treatment. Although the normal regimen is one tablet taken each day, the correct dosage and frequency of administration will be determined by your doctor based on the condition being treated, your current health, and the severity of your symptoms. These should be swallowed with a large glass of water and may be taken with or without food. A snack or meal is recommended prior to use if you experience nausea. Never change the form of the tablets by crushing or splitting the tablets before use to avoid destroying or altering the effects of their contents. What are the side effects of Apo-Prednisone (Prednisone)? Serious side effects that may require emergency medical attention are blurry vision, severe depression, swelling, severe weight gain, severe hypertension, low potassium levels, pancreatitis, seizures, or discoloured stools. Contact your doctor as soon as you experience any intense or worrying symptoms to make sure the correct adjustments are made to your dosage or application frequency to prevent further health problems from occurring. Apo-Prednisone (Prednisone) should not be used by patients who are young children, lactose intolerant, who have a widespread infection, a head injury, or a recent stroke. You are also encouraged to inform your doctor if you have osteoporosis, tuberculosis, myasthenia gravis, heart failure, a peptic ulcer, hypertension, hypothyroidism, glaucoma, herpes, ulcerative colitis, thromboembolism, epilepsy, ulceration of the cornea, depression, liver cirrhosis, liver failure, reduced kidney function, or if you are a women going through menopause. These conditions may cause unexpected health problems requiring special adjustments to your regimen. Strictly use Apo-Prednisone (Prednisone) as prescribed and follow all instructions provided by your doctor. Safe, suitable, and optimum dosage can vary and is dependent on the patient`s health and medical history, as well as the condition you are treating. Apo-Prednisone (Prednisone) may not be safe or suitable for all patients. Always ensure your doctor is informed if you are pregnant or breastfeeding, using any other type of medication (including non-prescription medicine, vitamins, and supplements), as well as if you have any allergies, other illnesses, or pre-existing medication conditions.